Typhoon Nesat has entered the East Sea and is heading towards the Gulf of Tonkin threatening the northern and central provinces and affecting the lives of thousands of fishermen still at sea, Vietnam's national weather bureau said Wednesday. By 7am Wednesday, the storm was centered 17.4 degrees north latitude and 116.8 degrees east longitude, about 490 kilometers east of Hoang Sa (Paracel) Islands. Strong winds near the eye of the typhoon peaked at level 12 moving at 118-133 kilometers an hour. Within the next 24 hours, the typhoon is expected to move west northwestwards at 20 kilometers an hour. 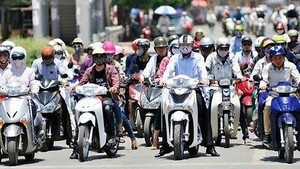 By the morning of September 29, it will entrench 240 kilometers north of the Hoang Sa Islands. Winds gales near its center will reach level 13, blowing at 134-149 kilometers an hour. 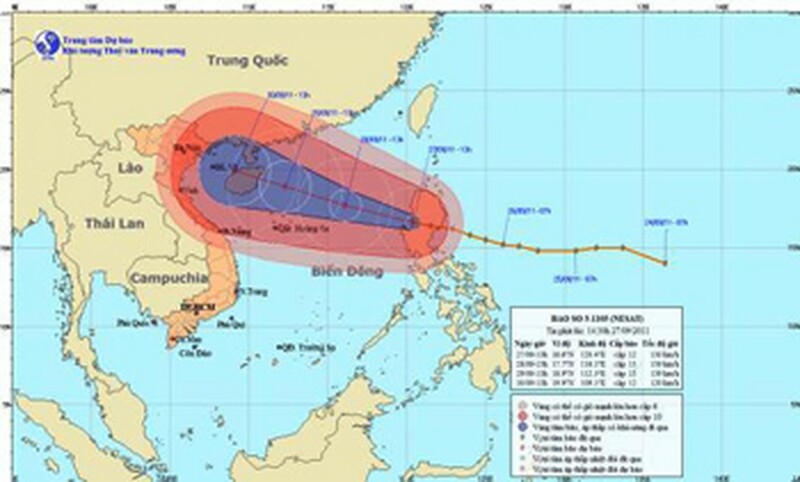 Le Thanh Hai, director of the National Hydro Meteorological Forecasting Center says the storm is probably set to enter the Gulf of Tonkin and will affect localities between Quang Ninh Province in the north and Quang Nam Province in the central region. The Central Steering Committee for Flood and Storm Prevention and Control sent an urgent dispatch to provinces from Quang Ninh to Binh Dinh and relevant ministries on September 27, asking them to prepare to cope with the typhoon. The center said that the storm might make landfall in Vietnam at the same time that a severe cold front also moves in, causing wide spread rain in the northern and central regions. Local authorities have been asked to guide all boats still at sea to shelters as quickly as possible to avoid the fury of the storm and also prepare to evacuate residents from landslide and flood prone areas. In related news, the death toll from Haitang typhoon and the subsequent flooding has risen to three with one still reported missing. The third body recovered was of Nguyen Vu Vien who had fallen off a fishing boat into the sea on September 26 in Phu Yen Province. His body was found on September 27 floating on the waters off Ninh Thuan Province. Scores of houses have been inundated and damaged, thousands of hectares of rice crops have been flooded and huge area of vegetables are now rotting. The People’s Committee of Tuong Duong District in Nghe An Province and local residents, joined hands to evacuate 13 households living at the foot of Pu Cam Mountain. The mountain has developed visible cracks about one kilometer long from the top of the mountain to its base, after persistent heavy rains over the last few days. The district has compensated each affected household with VND10 million as well as construction materials to build temporary shelters for their families. At least 45 households will have to be relocated from Xop Mat village, from fear of landslides due to cracks in the mountain. The mountainous district of Huong Son in Ha Tinh Province is ready to relocate 3,000 people from danger prone areas as the district is highly vulnerable to landslides and flashfloods.